The Greater Vancouver Area might have a reputation for mild winters but labels are not always accurate. Burnaby, on average, sees more snow than neighbouring Vancouver or Richmond, particularly in December and January. If you own or manage a business, Co-Op, Strata or apartment, you have a responsibility to safety! Keeping your property free and clear of snow and ice ensures the safety of your customers and residents. Specializing in these types of organisations, Gorilla Property Services can help with our annual Burnaby Snow Removal and Salting Service. Effective salting and snow removal usually involves late nights and early mornings which, let’s face it, not many people are a fan of. It is the little. Fortunately, our Burnaby snow removal and salting Services are carried out by the little known nocturnal Gorilla. They’re light on their feet, and able to creep around late into the night before expected frost or snow. Their massive, hairy hands make salting those walkways, steps, parkade entrances and other common areas a breeze. Arms built for swinging mean they never tire of snow removal, which they do with shovels and mechanical blowers only. But, don’t fret, because each Gorilla is professionally trained, and dressed! Flashy uniforms make us easy to spot, even in the dead of night. 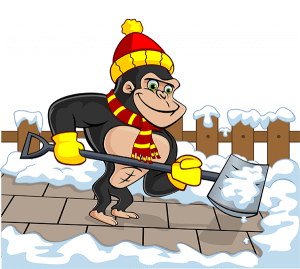 If you decide to go with Gorilla Property Services for all your Burnaby Snow Removal & Salting needs, there are certain assurances you can expect when our Gorillas arrive. Clients can rest easy knowing Gorillas work with WorkSafeBC and CGL coverage of $5 million. In addition, all work is carried out according to WCB regulations. Let us take the worry out of your Burnaby snow removal and salting. Rather than straining yourself, let us do the lifting, while you stay tucked up in bed.